I'm the guy who never recognizes the celebrities that walk by when everyone else apparantly has their eagle eyes out and is buzzing about them. I keep my head down and move forward, or something. Hey, did you just see Nicolas Cage sitting next to you at breakfast? "Where? Really? Where'd he go?". Hey, wasn't that Gillian Anderson we just walked by? "It was?". So when Jane Fonda walked by our table at Cafe Pasquale in Santa Fe, New Mexico last week, all I noticed was a refined older woman with dark sunglasses on and 70s-style feathered hair, and only when the waitstaff started tittering at our table did I get the sense that it might be someone of note. Oh right - I guess that was Jane Fonda. 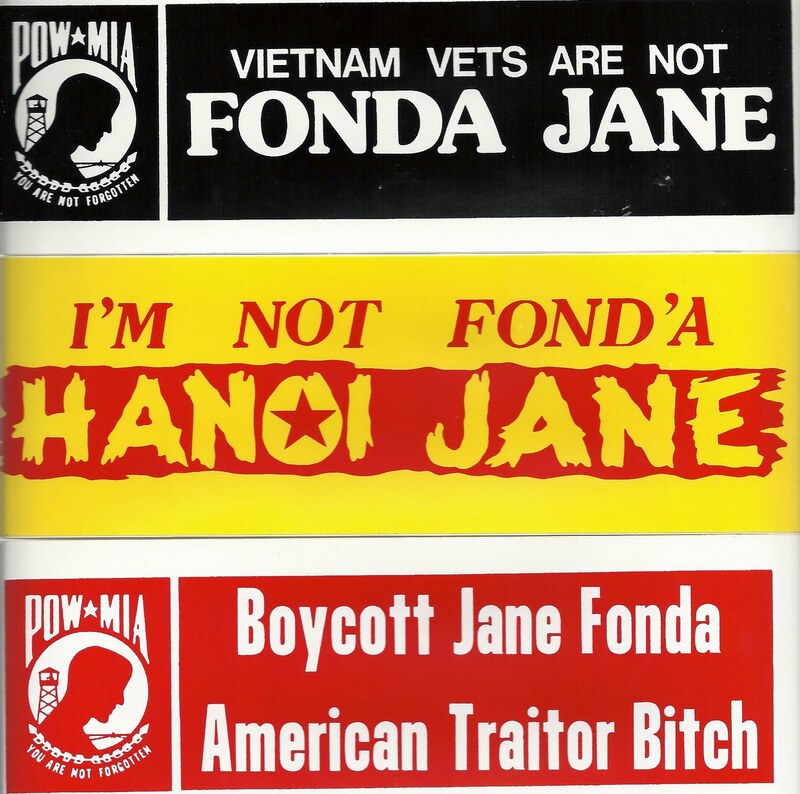 It reminded me that I've got a very fine collection stickers about Ms. Fonda that I'd like to share with you. I just scanned these for you now - part of my "conservative cranks of the 1970s" collection, which also includes an awesome "Ayatollah Assaholla" t-shirt I bought on eBay. Enjoy!